The Sony Ericsson Zylo runs the flash-based Media Center. Its menu lists the Photo, Music, Video, Games, RSS feeds and Settings icons. As we already said, there's an accelerometer on board so auto screen rotation is enabled. The Zylo has the latest Walkman player. Across the Media Center menus, you can enjoy screen auto-rotation. The player is compatible with numerous file formats, including the regularly used MP3, WAV, WMA, M4A and E-AAC plus the MegaBass equalizer preset and Stereo widening. 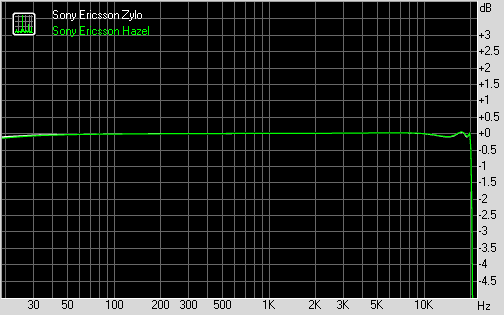 Surprisingly, the Zylo also supports the HD FLAC audio format – an open-source lossless audio codec. The interface colors of the Media center vary across different themes. The Walkman player on the Zylo also offers fun Styles – skins that change the look of the player into a vinyl record player, a reel-to-reel tape player, CD player and others. There is no shake control however, despite the built-in accelerometer. It is a hip feature – on phones that support it you can skip songs or even shuffle the playlist by just a flick of the hand. TrackID is also present – it analyzes the currently playing song on the radio or whatever it picks up with its mic and retrieves the performer and name of the song. Unfortunately, the Photo gallery can get quite laggy when there are a lot of photos in a folder. At times, the phone froze for a couple of seconds before moving on. The Sony Ericsson has no inbuilt GPS receiver but it still can geotag camera images (using Cell-ID). Then, you can use the View on map option in the image gallery. It allows you to check the place where the shot has been taken directly on the map using the preinstalled Google Maps application (data charges may apply). The video player in the Media center supports fast-forwarding and rewinding, and the interface is simple and stylish. The video files are accessible via the file manager too. Display mode automatically switches when the phone is rotated. It works with the MP4 and 3GP video formats. The video player can also show subtitles, it handles the .SRT format. Subtitles are displayed against black background. We wish this was more customizable – options like text size, background opacity and so on would have been nice. The video section also keeps the pre-installed YouTube client, which gives you full access to clips and uploading, bookmarked favorites and so on. The inbuilt FM radio of the Sony Ericsson Zylo has memory for 20 stations and supports RDS. It has a nice interface and makes great use of the TrackID music recognition service. The radio can be minimized in the background much like the music player. Unsurprisingly the audio quality of Walkman-branded Sony Ericsson Zylo is great. The handset performed excellently in each and every part of our traditional tests, scoring some pretty nice results. The distortions are also neatly kept under control and if it wasn't for it being slightly on the quiet side we would pronounce the Zylo a perfect portable audio player.